VeloGear is pleased to announce the release of Red Zinger/Coors Classic: Where It All Began, an 8 hour, 3 disc DVD set which commemorates the race that launched American cycling. The DVD is available now through VeloGear.com and major bicycle industry distributors. Nearly thirty years after its first race, the Red Zinger/Coors Classic is available on DVD. 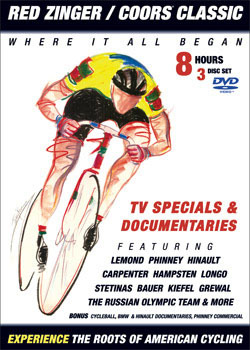 VeloGear has teamed with race producer Michael Aisner to present 8 hours of rare television coverage and documentary footage restored and re-mastered in a 3 DVD set. Aisner, now a film documentarian, compiled spectacular race film reels and behind-the-scenes footage to create the first, only, and official video compilation of the Red Zinger/Coors Classic. The DVD set begins with the 1977 Red Zinger and spans the '80s through ESPN's coverage of the final Coors Classic race in 1988. Bonus features include a 7-Eleven Superbowl television commercial, the bizarre European sport of Cycleball, and a balancing competition called "The Slow Race". The Red Zinger and Coors Classic stage races showcased world-class men's and women's cycling throughout the scenic terrain of Colorado, California, Nevada, Wyoming, and Hawaii. The race was considered the fourth biggest race on the world cycling calendar and was ground-breaking as the single biggest women's stage race ever held. On December 7, Aisner and VeloGear released the Red Zinger/Coors Classic DVD in a launch party and race staff and rider reunion in Boulder. The event was attended by over 500 people, including Davis Phinney, Connie Carpenter, Andy Hampsten, Ron Kiefel, Jim Ochowicz, Alexi Grewal, Jock Boyer, Alan McCormack, and raised $1,500 for the Davis Phinney Foundation. Phinney received a standing ovation after an emotional thanks to the Coors Classic family. Video and photos of the event are available at VeloNews.com.